Tokyo Rebel: Ho ho ho, it's new Atelier-Pierrot! Just in time for Christmas! Ho ho ho, it's new Atelier-Pierrot! Just in time for Christmas! Probably our last shipment to arrive before Christmas, we just received some new items from Atelier-Pierrot, including many many mini-hats! This is our display case right now, and we have multiples of some of these. Still, the last time we had mini-hats from Atelier-Pierrot, they sold out in one day. We ordered as many as they would send us this time, but even so, they probably won't last too long. 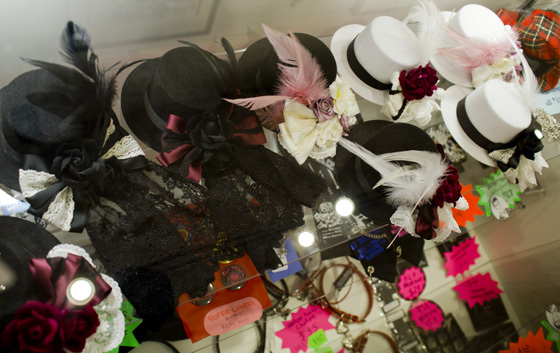 These hats are being sold under Atelier-Pierrot's Carina e Arlequin brand name, made by Atelier-Pierrot. Of course we stocked their current bustle corset skirts and dresses, vest style dresses and mini-dresses as well in various colors and fabric choices. That includes the bustle corset skirt in plain black, which we'll be surprised to see in our store more than a day - many people ask us for the staple colors and fabrics, and Atelier-Pierrot actually rarely produce them. So this is the first time we've had the bustle corset skirt (with shirring) in plain black in a good while. We advise you to hurry if you want it. 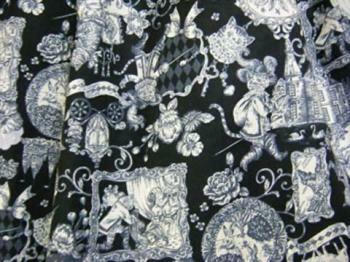 And lastly, we have Atelier-Pierrot's Cat Soldier print in black. 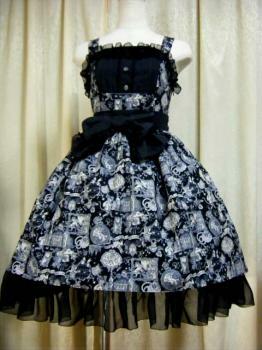 Only $259 for an Atelier-Pierrot print with a bustle in the back! You can't beat that deal. Includes a separate waist belt too. We'll have more/better photos of this print when we post it to our web site for ordering. * Bustle Corset Skirt (violet/L) - $229 already sold out! As usual, all items are available in our store now. We'll endeavor to have them posted to our web site by tomorrow or Thursday at the latest. The restocked items are linked above for ordering immediately. ** Due to the color and delicacy of these two dresses, we won't be displaying them on our store floor, but you can ask to see them!